Here’s a cake I did just before the weekend. It was a rush order. I made the filling (raspberry), the fondant, the frosting, and the cake (white), and put the whole thing together in one night. Quite a feat, I would say! And the result? You be the judge! I think it is great. I wish I worked well with fondant! To dream! I had a little fight with the fondant. You can’t really tell, but I had to give her some implants, because the cake underneath made her look lumpy. Ha ha! If only you could turn your Tres Leches cake into something like this! 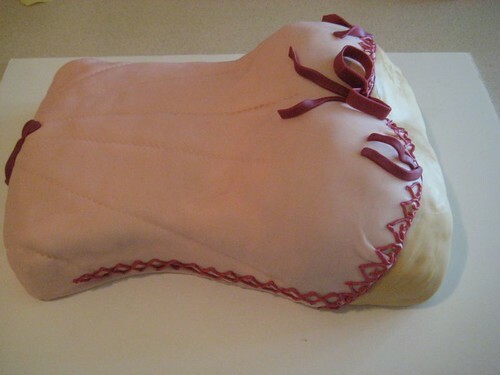 Then your hubby would really love this cake!